The NRC’s 28th Annual Regulatory Information Conference is scheduled for March 8-10, 2016, at the Bethesda North Hotel and Conference Center just off of Rockville Pike in North Bethesda, Md. So mark your calendars! Pre-registration will be available online beginning in early January 2016. 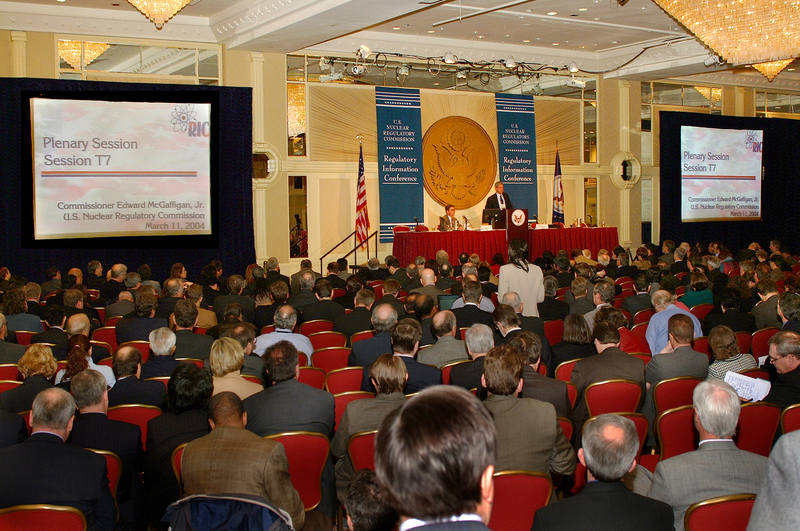 In this photo, Commissioner Edward McGaffigan, Jr., gives a presentation during the 2004 RIC. This Boston native and self-described John Kennedy Democrat was first appointed to the Commission by President Clinton in 1996. Commissioner McGaffigan died Sept. 7, 2007, after a long battle with melanoma. He holds what distinction among former and present Commission members? Yes, he was the longest serving Commissioner in NRC history, appointed by President Clinton in 1996 and 2000, and by President Bush in 2005 to an unprecedented third term. The RIC is open to everyone. Suggested Topic for your conference…The Premature Shutdown of the US Nuclear Plants. As more old nuclear power plants in the US are shutdown early due to not being economically viable in today’s energy market and/or have safety and regulatory issues, how much is the US NRC downsizing as well? For example, Entergy, the owner and operator of the Pilgrim Nuclear Power Plant near Boston, just announced that they would be terminating operation of Pilgrim by 2019 or earlier due to economic and regulatory issues. Over 600 Entergy employees there will be losing their jobs. How many NRC employees will lose their jobs too as a result? Hopefully they will also enable everyone that cannot physically attend to add their voice, by opening up the Conf. to everyone via the web. Commissioner McGaffigan was the longest serving commissioner in the history of NRC. I believe that Commissioner McGaffigan has the distinction of being the longest serving Commissioner in NRC’s history.